Thailand is an emerging economy and is considered a newly industrialized country. It is the 2nd largest economy in Southeast Asia after Indonesia. The economy of Thailand is heavily export-dependent, with exports accounting for more than two-thirds of gross domestic product (GDP). Substantial industries include electric appliances, components, computer components, and vehicles. The Thailand industry has an annual output of near 1.5 million vehicles, mostly commercial vehicles. Most of the vehicles built in Thailand are developed and licensed by foreign producers, mainly Japanese and South Korean. The Thai car industry takes advantage of the ASEAN Free Trade Area (AFTA) to find a market for many of its products. Agriculture has been experiencing a transition from labor-intensive and transitional methods to a more industrialized and competitive sector. Rice is the most important crop in the country and Thailand had long been the world's leading exporter of rice, until recently falling behind both India and Vietnam. Electronics is Thailand's largest export sector, about 15% of total exports. Thailand exports over US$105 billion worth of goods and services annually. Major exports of Thailand include rice, textiles, footwear, fishery products, rubber, jewelry, cars, computers, electrical appliances, manufactured goods, machinery and equipment and foodstuffs. Major export partners of Thailand are China, Japan, the United States, the European Union, Malaysia, Australia and Singapore. Thailand is a newly industrialized country. With a well-developed infrastructure, a free-enterprise economy, and generally pro-investment policies Thailand's economy has been strong due in part to competitive industrial and agriculture exports. Thailand is a member of the World Trade Organization (WTO), the Cairns Group of agricultural exporters and the ASEAN Free Trade Area (AFTA), and has pursued free-trade agreements. Machinery and parts, vehicles, integrated circuits, chemicals, crude oil, fuels, iron and steel are among Thailand's principal imports. The increase in imports reflects a need to fuel production of high-tech items and vehicles. Thai imports also include computers, consumer goods, raw materials, intermediate goods, materials of base metal. Main import partners of Thailand are Japan, China, the European Union, the United Arab Emirates, Malaysia and the United States. 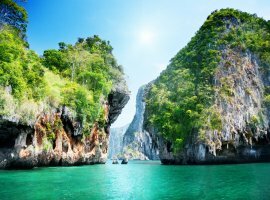 Thailand is a country situated at the centre of the Indochinese peninsula in Southeast Asia. It is the world's 51st-largest country, bordered by Myanmar, Laos, Cambodia, the Gulf of Thailand, Malaysia, the Andaman Sea. Thailand shares maritime borders with Vietnam and Indonesia and India. The country is a member of Asia-Pacific Economic Cooperation (APEC), Association of Southeast Asian Nations (ASEAN), International Chamber of Commerce (ICC), World Trade Organization and other international organizations. Thailand has a two-column tariff based on the Harmonised System. Tariff duties on goods are levied on numerous import items and on an ad valorem or a specific rate basis, whichever is higher. Suppliers or manufacturers invoices generally determine cost values and quantities. The customs authority, however, has the right to reassess the value of goods found to be valued manifestly lower than the market. Preferential rates are accorded selective imports from other ASEAN countries. The majority of imported articles are subject to two different taxes: tariff duty and Value Added Tax . Tariff duty is computed by multiplying the CIF value of the goods by the duty rate. This is added to the value of the goods to determine a final tax. VAT is then levied on the total sum of the CIF value, duty and excise tax, if any. Goods imported for re-export are generally exempt from import duty and VAT. Although most products are freely transportable within Thailand provided import duties are paid there are import restrictions on some products and exporters are required to check these with the Thai Ministry of Commerce prior to exporting. The control of the import, marketing, distribution and sale of products is shared between a number of government bodies including the Food and Drug Administration (FDA), the Customs Department, the Ministry of Agriculture and the Ministry of Commerce. The Ministry of Commerce designates classes of goods that are subject to import controls, which usually take the form of permission and licensing. Strict requirements governing the labelling of dairy foods, baby foods, canned foods, vinegar, beverages, edible oil and fats, and gourmet powder (defined as an article containing monosodium glutamate (MSG) and used for food seasoning) must be met. Food products must be approved and registered with the Food and Drug Administration (FDA). When seeking registration importers must supply two samples of each product, details of the exact composition by percentage of each ingredient, and six labels. Foodstuffs in sealed containers are subject to specific regulations. Labels for alcoholic beverages must advise the percentage of alcohol content. There must also be a health warning, printed in Thai, on the label or on a sticker, with specific wording. Specific regulations govern the labelling on cosmetic products. Packaging should be secure and able to withstand extreme heat and humidity. Consideration should also be given for possible storage in the open. As merchandise may be landed in Thai ports from open lighters, waterproof packing should be used where necessary. The use of hay and straw should be avoided. Certain types of seeds, plants and animals require phytosanitary certificates issued by the approved authority in the country of origin. This is required for establishment of letter of credit, and should include similar details to the commercial invoice. There is no prescribed form but precise details are obligatory. A minimum of five copies is needed. A minimum of five copies is required, and must accompany each invoice if goods are packed in more than one case. If requested, a Certificate of Origin must be issued by an approved authority.